1) Retro 101: Retro 101 is my one true love. If you have a love of whimsical dresses, sassy (often Beyonce-inspired) shirts, and Indiana-themed flasks, this is the place for you. Their fashion bus is lovingly dubbed “Elie”, and she rolls all over town. My ultimate pop-up shop triumph was wearing a Retro 101 dress while ON the bus, and then getting photographed stepping off the bus. With pop-up shops, there’s a slight risk of inventory options, but Retro 101 keeps pieces moving quickly, and prices are remarkably affordable (dresses normally run you $20-$40). You can see their schedule on their website, and find where Elie’s headed to next on Twitter @ShopRetro101. 2) Lefty’s General Store: I love Lefty’s and not just because I’m a fellow southpaw. Mary Godley has curated a beautiful collection of simple designs on clothes, accessories, and home decor products. Her shop consists of a mix of mostly neutral palette items with intentional embellishments like a geometric pattern or well-placed pop of color. According to Mary, “it’s for people who are interested in paying a little extra for a made-by-hand statement piece that they will treasure. There is a slow-fashion movement taking hold across the country, and consumers are noticing that a lot of the cheap clothes and objects we buy at big box stores wear out quickly and end up in the trash. At Lefty’s we strive to offer unique pieces made by individual artisans who pay careful attention to using environmentally-friendly production methods and creating high-quality goods.” Lefty’s also carries my all time favorite sea salt spray for perfect wavy beach hair. I will agree that the items are a bit pricier, but the quality is fantastic. 3) On the Cusp Design: Most of us remember when Indianapolis was thrown into a not-so-pleasant national uproar over RFRA a couple of months ago. There were many local artists and business owners who had immediately beautiful reaction pieces, and one of those was On the Cusp Design. 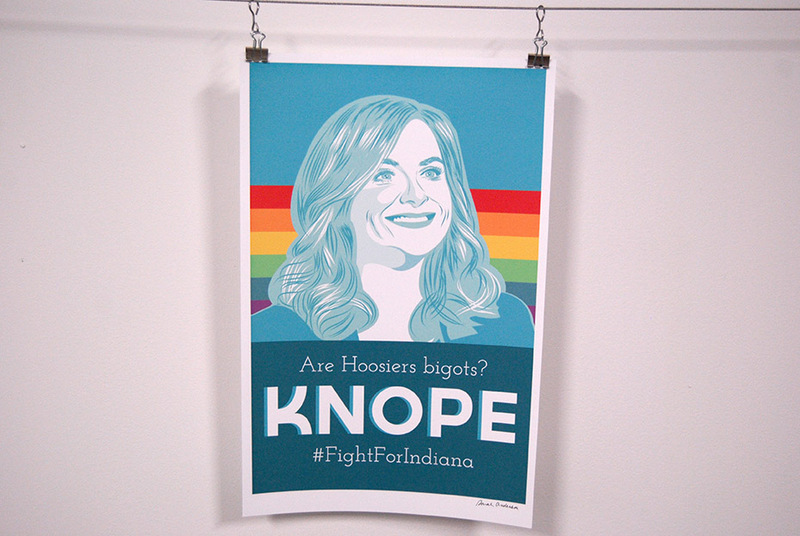 Their feature of Leslie Knope, the fictional Hoosier from the show Parks and Recreation, was my glimmer of hope and pride coming out of a frustrating time in Indy. I loved it so much, that I chose their design to be the image I shared on Instragram to accompany the TrndyIndy piece written on RFRA. 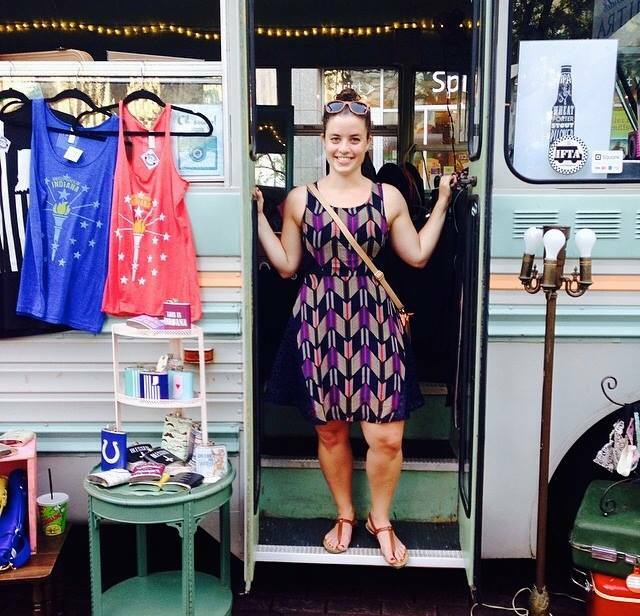 I love On The Cusp because of their love of Indy and promoting all things Indiana. Case in point- their precious robot design, rivaling the cuteness of Wall-E, which is On The Cusp’s interpretation of the Indy skyline with the Chase tower as Indybot. You can check out an On the Cusp pop-up on June 13th from 12-8 p.m at the INDIEana Handicraft Exchange (7505 N. Delaware Street). They also often participate in First Fridays, as they have their workspace at the Stutz Building. On The Cusp’s pop-up shop will be at Down the Rabbit Hole event this Friday, June 5th at the Wheeler Arts Center on the University of Indianapolis’ campus, starting at 7:30 p.m. They’ve recently beeing working with the Indy burlesque community and will be selling many of their burlesque-inspired prints, as well as their Indy items. 4) Lux and Ivy: If you’re looking for a little bit vintage, a little bit designer, and a whole lot of rock ‘n’ roll, Lux and Ivy is your spot. This is the place that you should have gone to get the perfect outfit for the Lana Del Ray concert last week. With a name inspired by Stevie Nicks and Poison Ivy of The Cramps, rock ‘n’ roll fashion and style is at the heart of this well-loved pop-up. Started originally as an Etsy shop, Sarah Baldwin Schatz was looking for a creative outlet after leaving the consignment life, and Lux and Ivy’s pop-up was hatched. Lux and Ivy has grown quite a bit, to the point that they will now have a permanent home in the Murphy Arts Center. Their grand opening is this Friday, June 5th from 7-11 p.m. Though they’re establishing their own turf, Sarah has assured me that they’ll still be doing lots of pop-up events all over town. I hope they never feel they need to go elsewhere! Roll on, pop-up shops. We’re happy to have you here. Make sure to visit the pop-ups listed above, and let me know about good ones I’ve missed in the comments below!